Thank you to ShopRite Trading Company for providing me with Panettone in exchange for this post. No other compensation has been received. All opinions are 100% my own. 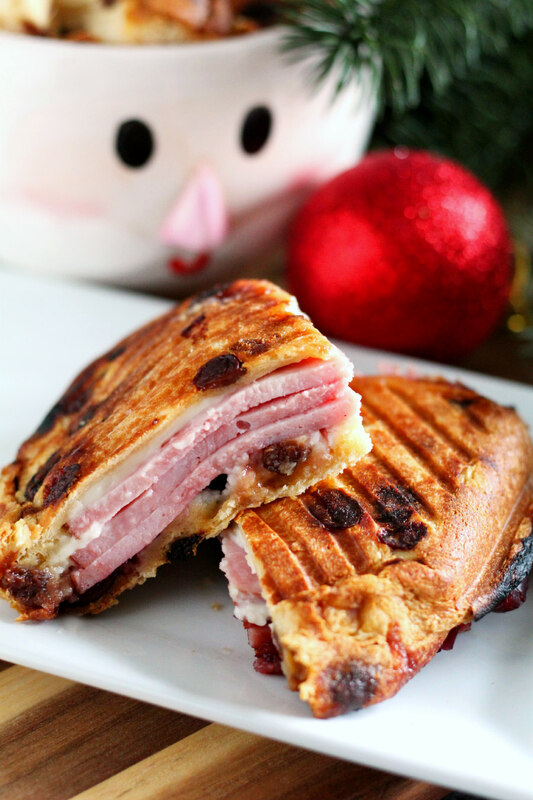 Put those holiday leftovers to good use by making a delicious, sweet and savory Ham, Cranberry, and Brie Panettone Panini! I can’t tell you the last time I had Panettone! It’s an Italian holiday sweet bread made with candied citrus fruits and raisins that’s typically enjoyed as a dessert. Lately, I’m seeing so many different ways to use this holiday bread that go way beyond just toasting it and spreading butter on top. I’ve heard it makes an excellent French toast and I’ve seen it used in sweet breakfast casseroles, too. But today I’m giving it a savory spin and using it in a sandwich made with holiday leftovers! One of my favorite things about the holidays is the food and especially the leftovers! They’re just so much better than regular weeknight leftovers! I recently bought myself a panini maker for Christmas and couldn’t wait to use it! So I thought about some of the holiday leftovers we had in the fridge and decided to make a holiday leftover panini using sliced Panettone. 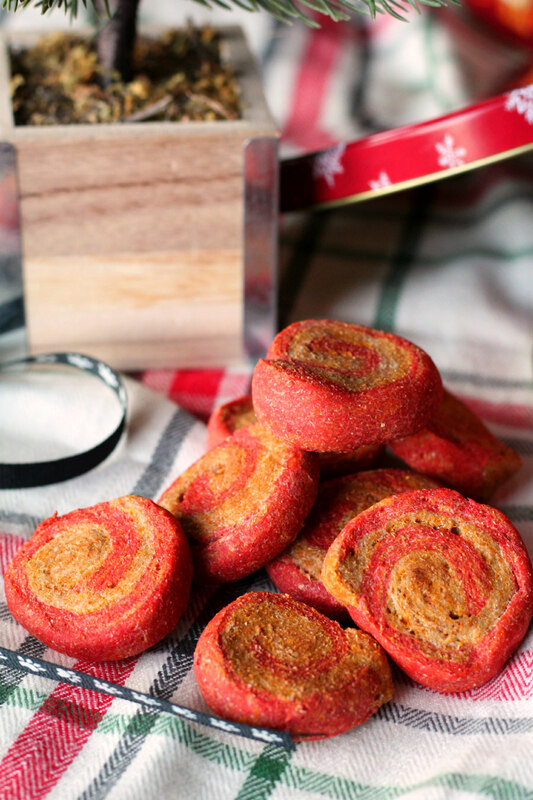 A sweet and savory way to use your holiday leftovers! We’ve had a lot of ham in our fridge and freezer this Christmas. I even went out and bought a 1/4 presliced ham that was on sale because we’ve been enjoying it so much! 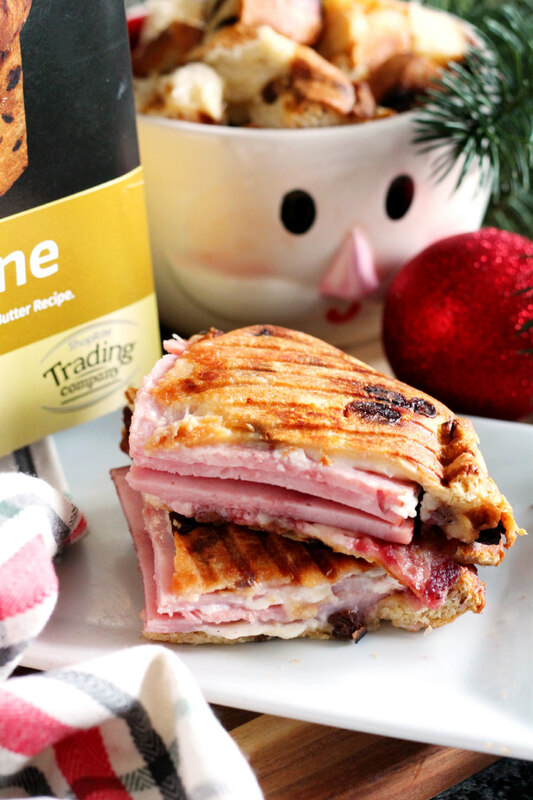 Holiday hams just have so much flavor and the leftovers can be used in so many ways. Fry up slices for breakfast with an egg, heat and eat it for lunch, or turn it into a casserole for dinner! This time around, it’s going to make an awesome panini filling! In addition to slices of holiday ham, this Panettone panini is made with soft and creamy brie and whole berry cranberry sauce. If you don’t have brie or you’re not much of a fan (sacrebleu! ), sub in slices of Swiss cheese instead. This panini has that sweet and savory combo that I love. It’ll definitely step up your holiday leftover game! 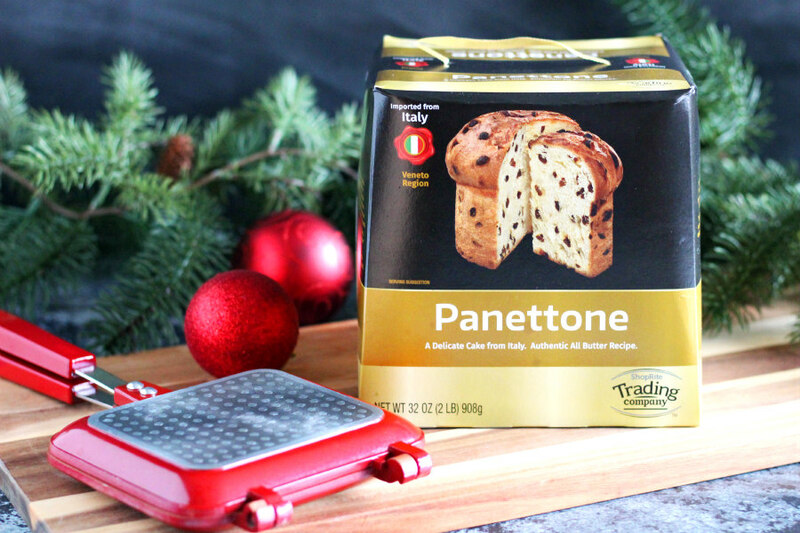 For each panini, slice the Panettone round down the middle to create the top and bottom sandwich slices. Spread the brie evenly on each piece of Panettone. Then, layer with slices of ham and cranberry sauce. Close the sandwich and place on the panini press. Grill the panini for about 4-5 minutes, on each side, or until the Panettone has become brown and toasted. If you don’t have a panini maker, you can always cook this like a grilled cheese sandwich. Just butter your Panettone slices and cook them in a skillet like you would a grilled cheese sandwich. 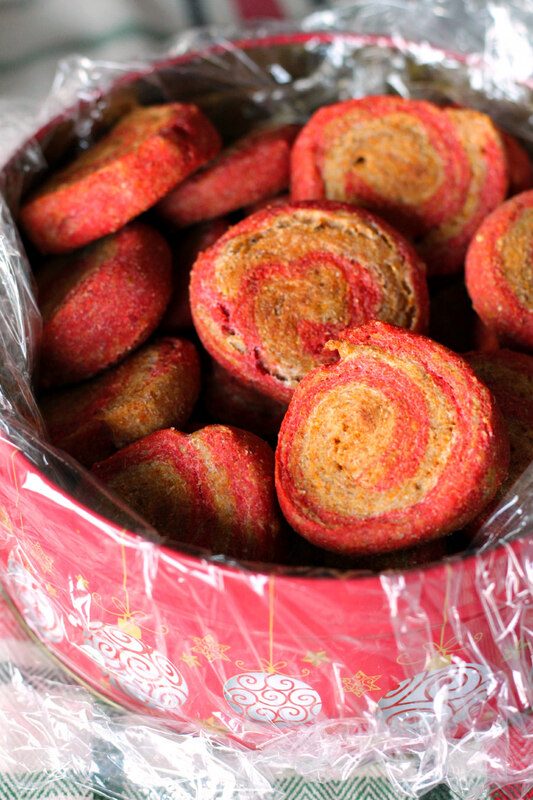 This is a creative and delicious way to use up some of your holiday leftovers! If you still have Panettone leftover after making paninis, cube the Panettone, toss it with a little oil, and toast the cubes in the oven to make sweet croutons for salads. 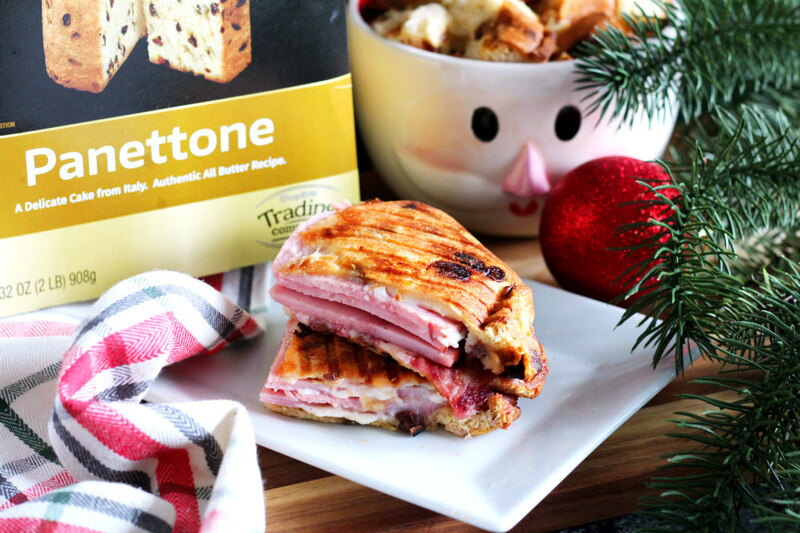 Or turn Panettone cubes into a savory bread pudding with ham and cheddar cheese! 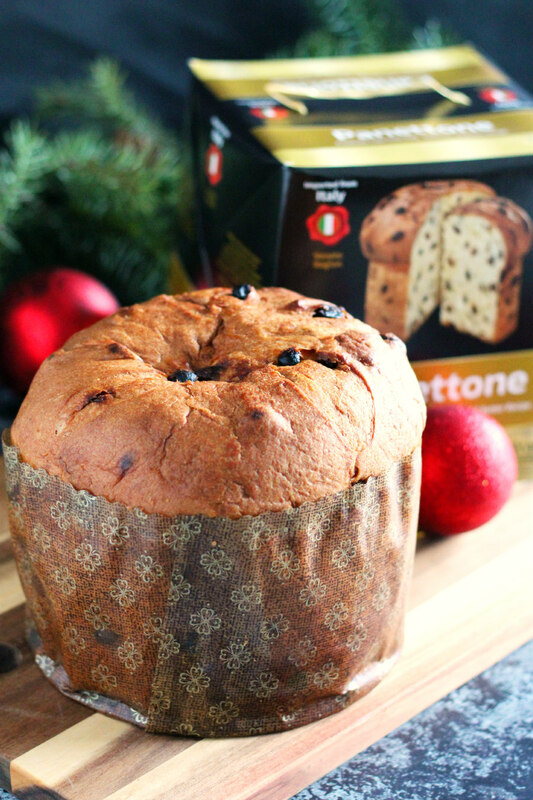 Check out ShopRite Trading Company’s products inspired by destinations all around the world, like this Italian Panettone! Holiday entertaining just got so much easier with these 20 Easy and Delicious No-Bake Holiday Treats! Christmas is fast approaching and, this time of year, I try to spend as much time as I can in the kitchen. 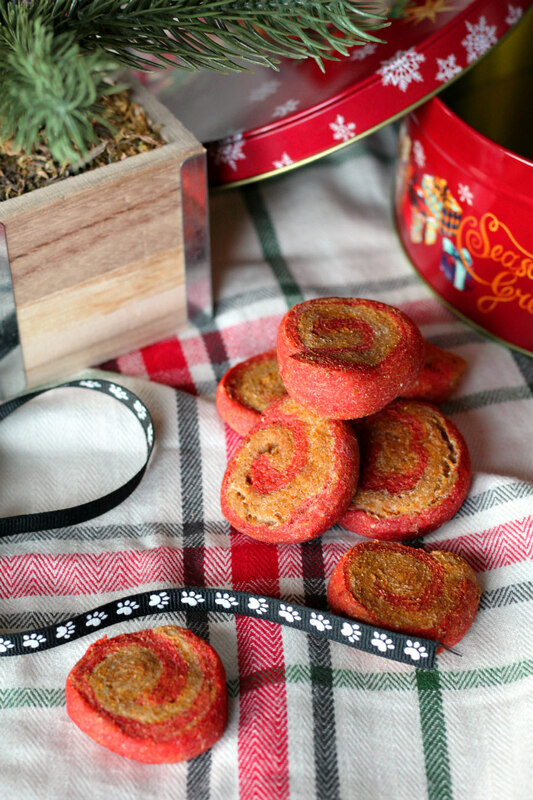 I like to turn up the Christmas tunes and whip up a couple batches of holiday treats to give alongside gifts. The past few years, I’ve been slacking on my holiday baking. Between lack of time and lack of interest, I haven’t had many homemade treats to dish out to family and friends. 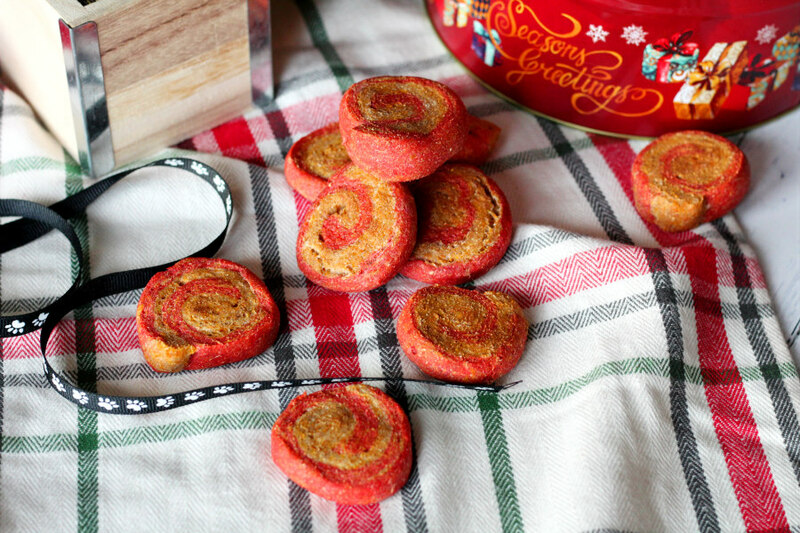 This year, I want to get my holiday baking streak back on track! I might take a few shortcuts, but I plan on filling a bunch of tins with an assortment of homemade treats. 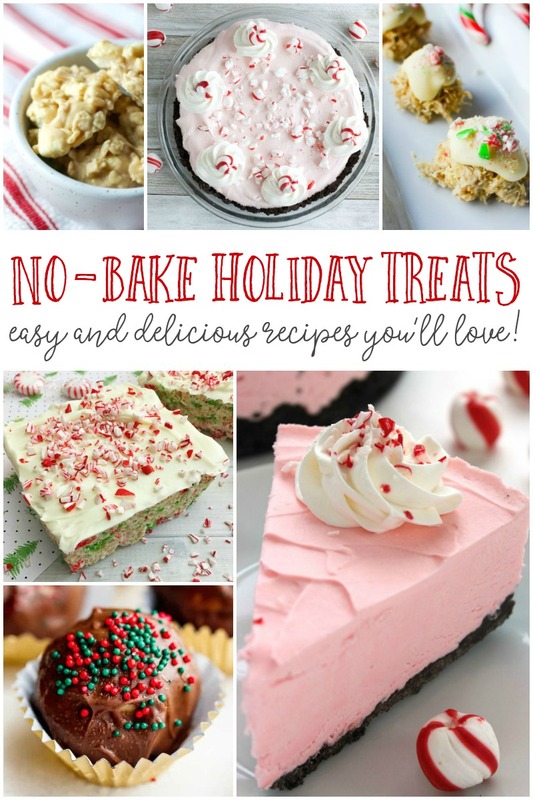 I’ll definitely be keeping a few of these no-bake holiday treat recipes on hand to add to trays and tins this year! No oven required? So easy! No Bake Caramel Cheesecake Dessert – Who Needs A Cape? And if you’re looking for a seasonal, no-bake dessert to add to your holiday table, check out my No-Bake Pumpkin Eggnog Cheesecake recipe! What’s your favorite no-bake holiday recipe? 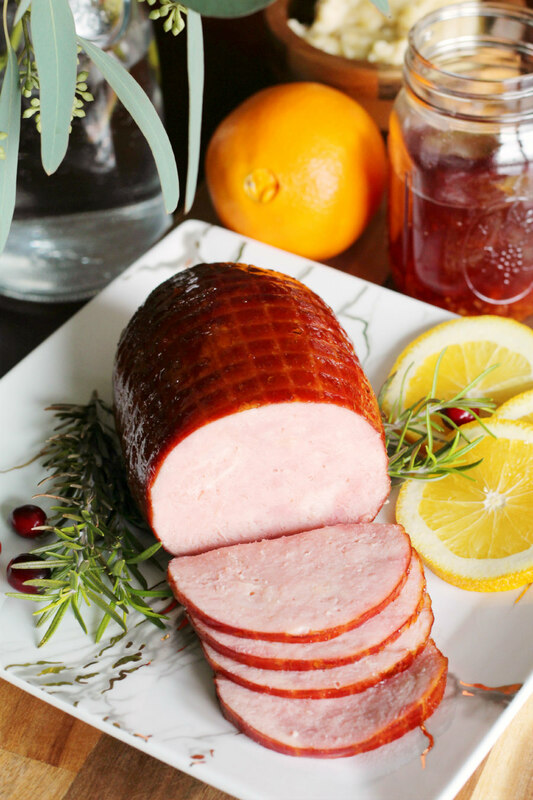 Take the stress out of holiday cooking with my Cranberry Orange Bourbon Glazed Holiday Hatfield Ham recipe. It’s an easy to make, super flavorful, classic holiday dish! There are 15 days left until Christmas! It’s hard to believe that it’s almost here! Going into the holiday season this year, I wasn’t exactly excited for it. Bouncing between holiday celebrations and deciding which family to celebrate with on Christmas Day can be completely exhausting and stressful for all! But this year has been surprisingly different. This year, we’re celebrating Christmas early with my husband’s family, spending time with my family Christmas Day, and having a quiet Christmas Eve at home. It’s so much easier than traveling back and forth, cramming all of our celebrations into one day! It’s the first year, in a few years, that I’m actually looking forward to each and every holiday celebration! I’ve made it my mission to keep the holiday season as stress-free as possible and enjoy as much of it as I can! So far, so good! I was able to get my Christmas shopping done early and wrapped presents as they came in. I made a list of Christmas cookies that I wanted to bake and have been eagerly checking it off. I’ve been binge watching my favorite Christmas movies when I can. And I’ve even managed to make us TWO holiday meals for dinner, just because! The Hatfield® Uncured Ham was the perfect size for my little impromptu weeknight holiday celebration. It’s a flavorful, ethically-raised, fully cooked ham that’s so easy to prepare. Hatfield has taken the stress out of serving a delicious holiday meal for your family. 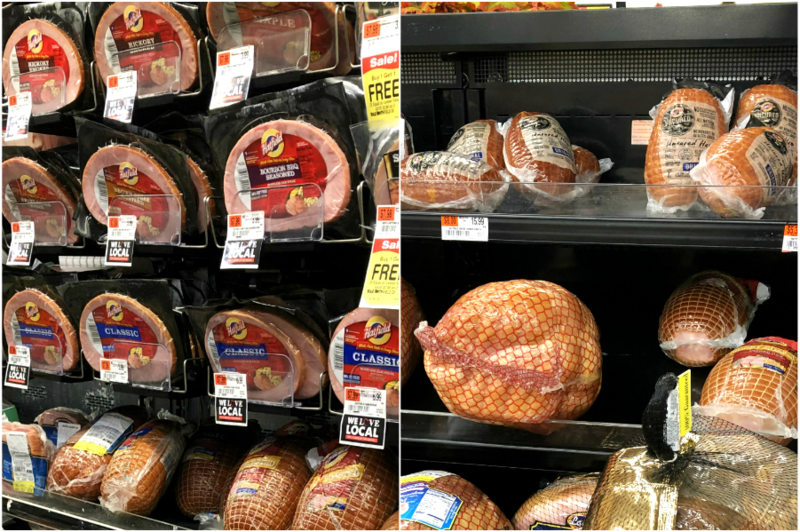 Hatfield’s NEW smaller sized hams are available in ½ Pre-Sliced Pit Ham, ¼ Pre-Sliced Ham (With Natural Juices or With Water Added), and are perfect for holiday gatherings, whether they’re big or small. 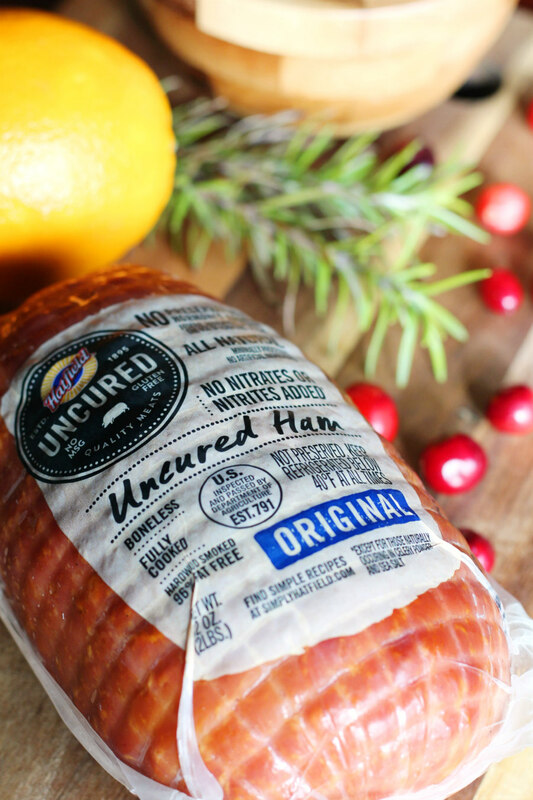 For a limited time only, you can receive a $2 rebate with your purchase of any Hatfield® Uncured Ham on Ibotta. Is it even the holiday season without the ham? It just wouldn’t be the Christmas season without ham on the holiday table! If you’re like us and have more than one celebration to attend, you know you’ll basically be eating one ham after the other! And probably for days after that (love those leftovers)! I decided to step up our holiday ham game with a new glaze made with orange marmalade, cranberry juice, and bourbon. 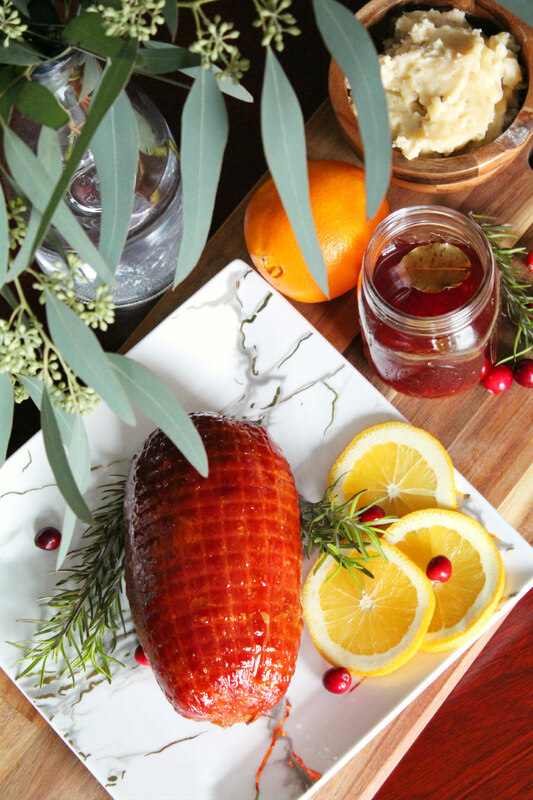 My slightly sweet and super flavorful Cranberry Orange Bourbon Glazed Ham will be a hit with your family this Christmas! Remove ham from packaging and place into a roasting pan. Combine orange marmalade, bourbon, brown sugar, cranberry juice, and bay leaf in a saucepan. Bring to a boil, then reduce to a simmer and continue cooking for about 5 minutes. Discard bay leaf and reserve about a cup of sauce to serve with the ham. Brush glaze over the ham and season with salt and pepper. Add 1/2 inch of water into the base of the roasting pan. Tent with aluminum foil and bake 40-45 minutes, or until ham reaches 140ºF. Remove ham from oven. Baste and let the ham stand for about 10 minutes before slicing. Serve with extra glaze, if desired. Not going to lie, this is probably one of the best hams I’ve ever made and it was so easy to make, too! Since we’re keeping things simple this holiday season, I wanted to share a few tips to help you prepare an amazing holiday meal and still be able to enjoy quality time with the family! Cut your prep time by chopping up vegetables and measuring out other ingredients the night before. It’ll make cooking up your holiday feast a lot easier by cutting out all of that prep time! Set your holiday table as early as possible. That way you’re not scrambling to get your table set before guests arrive. You’ll give yourself more time to make an impression with pretty table settings and centerpieces! 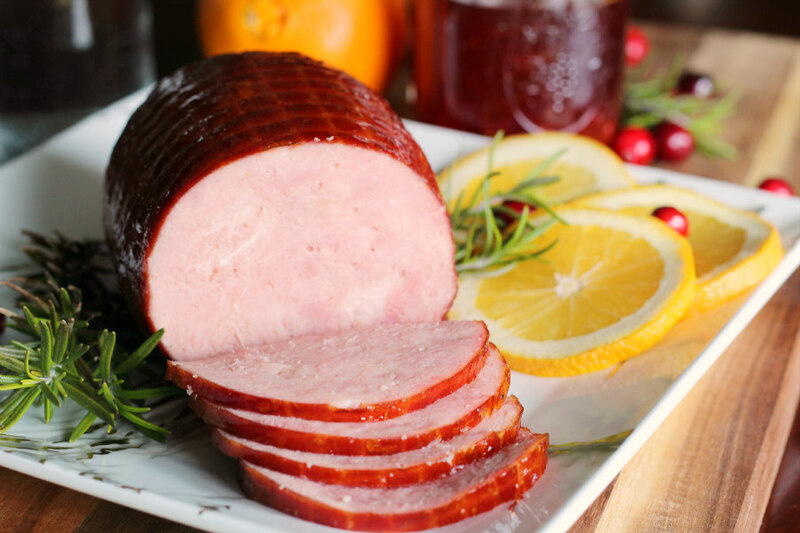 Go for quality and convenience with a family owned, American made Hatfield Ham this holiday. It’s a gluten-free and seriously delicious holiday meal. Grab a pre-sliced ham and go straight from the oven to the table. Stock the freezer with frozen side dishes. 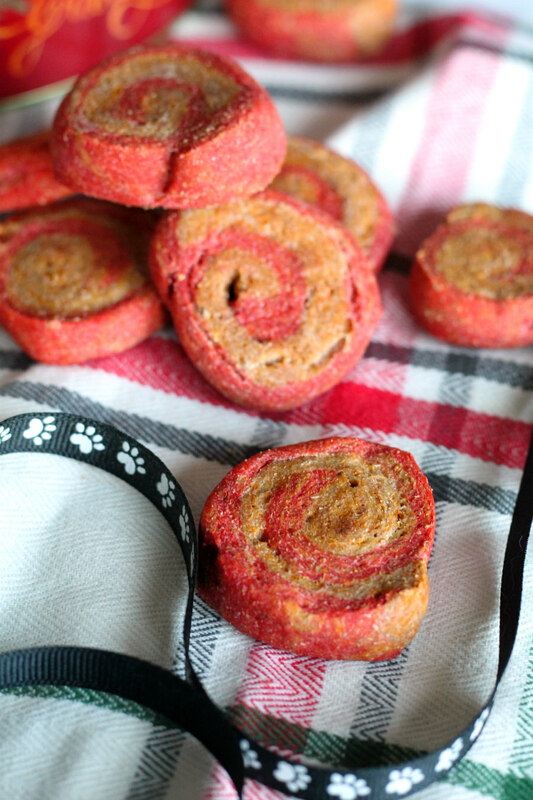 Some of them taste just as good as homemade and take way less time! Keep classic sides on hand like mashed potatoes, squash, or Brussels sprouts. Even if you’re not serving them heated straight from the package, they’ll be easier to doctor up with seasonings and other ingredients! If there’s one thing that’s as good as the holiday meal itself, it’s the leftovers! After we dish out containers to our family, I’m always excited to start thinking about meals I can create with leftovers. Leftover ham is perfect for ham and eggs in the morning, a delicious ham, brie, and cranberry sauce sandwich for lunch, or a ham and cheese calzone for dinner! Find Hatfield Hams in the meat case, or special holiday cases, at ACME or where Hatfield products are sold near you. Don’t forget to grab the $2 rebate offer off of Ibotta before you shop! 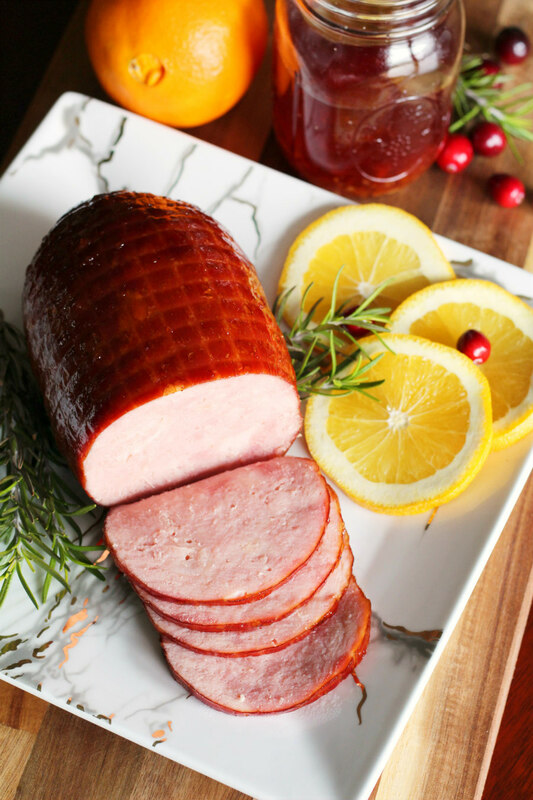 It’s the holidays – take the stress out of your holiday dinner with a Hatfield ham and my crazy good recipe for Cranberry Orange Bourbon Glaze! 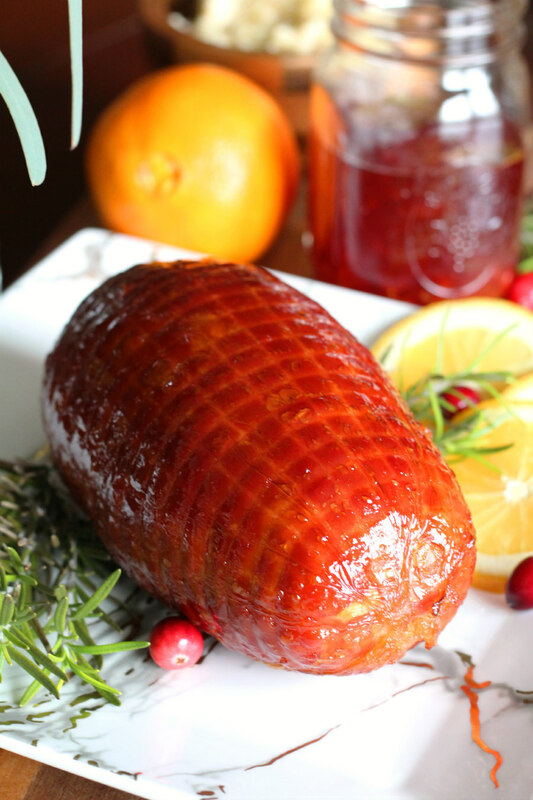 Do you have a favorite homemade glaze for your holiday ham?